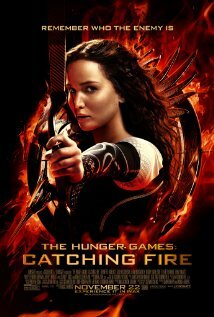 Katniss Everdeen (Jennifer Lawrence) and Peeta Mellark (Josh Hutcherson) are the targets of President Snow (Donald Sutherland) after their unconventional victory in the 74th Hunger Games has managed to give hope to the Districts of Panem– a hope that has led to rebellion against the government. Now, after a disturbing victory tour of the Districts a wrinkle in the rules will thrust Katniss and Peeta once again into the Hunger Games, but this time the rules and contenders are slightly different, they’re all previous victors of the hunger games. With a revolution catching fire, alliances and friendships must be made, but who to trust and how to exit the games alive again? Directed by Francis Lawrence, a clear vision for a film of such large scope seems sharp and focused. And, while in many regards Catching Fire is a repeat of The Hunger Games, there’s enough new and interesting to keep things fresh. Performances from all are tip top, with standouts from Stanley Tucci, and a few extra laughs from Woody Harrelson. Still visually impacting, and fight sequences will keep viewers on edge, the mission seems accomplished, although the necessary first act does feel a little drawn out, you could do worse. Music from James Newton Howard fills the auditory palate round and full. A worthy contender for the weekend, The Hunger Games: Catching Fire is rated PG-13. Leading up to and during the terrors of World War II a bright eyed young adopted girl, Liesel (Sophie Nélisse), is raised by an older German couple, the gentle and kind Hans (Geoffrey Rush) and the stern but caring Rosa (Emily Watson). During her stay Liesel makes few friends, but one boy her age, Rudy (Nico Liersch), takes a liking to her, still, secrets surround their friendship. All the while, Liesel’s hunger for education and reading is a drive that fuels her need for books, that, and the Jew hidden in the basement. An understanding of the horrors and fears of living in Hitler’s Germany becomes apparent and truthful, an ending that can’t possibly pan out well. What’s to become of Liesel, Rudy, Hans and Rosa? Based on the bestselling book The Book Thief, close attention to detail in this painful period piece illustrates how a society driven by fear can be turned xenophobic to horrific measures, and, how otherwise innocent men, women, and children were broken down and rebuilt in the Nazi socialist vision. 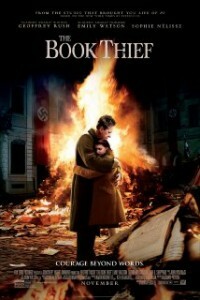 Directed by Brian Percival with music by John Williams The Book Thief has the markings and polishing of a large budget epic, but maintains the heart and soul of a special gem. And, from stem to stern the ensemble acts the heck out of this one, get ready for the water works, you’re in for a beautiful and emotionally challenging film. Totally worthy of your time, The Book Thief is rated PG-13. Inspired by a true story a recently terminated spin doctor for the British government, and former BBC journalist, Martin Sexsmith (Steve Coogan), is at a crossroads in life. Looking to continue with hard news writing, Martin is instead given the opportunity to write a human interest story that will challenge him journalistically and philosophically. The task is to help an elderly woman, Philomena (Judi Dench), find a son she gave birth to 50 years ago in an Irish convent but was forced to give up for adoption against her will. Challenging the Catholic church, political systems, and the human spirit Philomena and Martin’s road will not be an easy path, but a rewarding conclusion is in store if they’re successful. How will they fare? Pet project for Coogan who co-wrote, produced, and acted in, this delightful gem has all the makings of an art house charmer; heart wrenching story, strong performances, and just the right amount of British humor and wit dashed to taste. Albeit, at times it does seem as though Coogan has rounded off his character a little too much to placate audiences, a move that detracts from his believability a bit. None the less, an emotional ride is in store for all who climb aboard. Worth your attention this weekend. 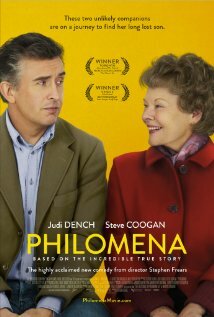 Philomena is rated PG-13.